avril 2018 (Human Village 32). I feel honored to address this august National Assembly and its Distinguished Members ; and through you, Honorable Members, the entire people of the Republic of Djibouti. I would like to seize this rare opportunity to thank the President of the Republic of Djibouti, H. E. president Ismail Omar Guelleh ; the Government and the brotherly people of the Republic of Djibouti for the warm welcome accorded to me and my Delegation since we have arrived at the beautiful city of Djibouti. As you all know, our historic relationship stands as an example not only to the IGAD Member countries, but to the entire continent of Africa. Ours is a unique relationship between one and the same people, living in two sovereign neighboring countries, whose common destiny is intertwined through a long history of fraternity, mutual trust, respect and strategic interests for the benefit of our peoples, the Region and Africa at large. Our relationship has been solidified through time because of the shared vision of the leadership and its unflinching commitment in the path of economic integration. Our bilateral relations is witnessing encouraging momentum in all aspects. We have anchored our cooperation on a solid foundation. We have put in place important instruments such as the joint ministerial commission to help us deliberate on multitude of issues of mutual interest. On the other hand, our development endeavors in the construction of roads, utilization of ports, railways, telecommunications networks ; and power links, while contributing to the economic and social well-being of our peoples ; facilitate also, on the other hand, the regional integration we have embarked on. The recently inaugurated Railway line linking Addis Ababa to Djibouti does not only carry people, goods and services ; beyond that it is a vital umbilical-cord that continues to connect our two peoples’ cultures, traditions and cherished common values of fraternity and togetherness. Notwithstanding the exuberant achievements we have scored so far, we need to further cement our bilateral relationship by diversifying and widening the areas of our cooperation. Recently, the administrators of our adjoining regions along our common border have concluded a fruitful meeting at Samara, the capital of the Afar Regional state of Ethiopia. These, along with the joint military and security activities, have enabled us to have safer and more peaceful common borders than ever before. The commendable people-to-people relationship has been enhanced through the meetings of the traditional elders ; and the tourism flow, which we need to encourage further. The role of our Parliaments and Parliamentarians is very pivotal in enhancing our people-to-people relationship. I would not pass without indicating my sincere appreciation of the strong inter-parliamentary relationship between the institutions of our two countries ; and their tireless efforts to enhancing democracy. I also understand the active role of our Parliaments in the IGAD inter-parliamentary relations. We have laid together the solid infrastructure of economic integration ; however, our policy-makers and parliamentarians are expected to work on the soft-infrastructure of policy harmonization, which would take our ever growing move towards complete economic integration to a higher level. I have full confidence in you and your counterparts in Ethiopia to push forward this agenda for the benefit of our two peoples. Beyond our bilateral relationship, which has been witnessing tremendous growth day after day, the Republic of Djibouti and the Federal Democratic Republic of Ethiopia cooperate in sub-regional, regional and multilateral forums such as the IGAD, COMESA, the AU and the United Nations. Our two countries work closely and successfully in fighting challenges of regional stability and bringing peace to the troubled region within the IGAD framework. We are playing our part in important peacekeeping operations in the region and leading reconciliation efforts in major hotspots. Honorable President of the National Assembly of the Republic of Djibouti, Dear Brother Mohamed Ali Hoummad, I thank you ; and indeed, I thank all the Distinguished Members of this august Assembly in giving me the opportunity to share with you thoughts about our relationship ; and address you. I thank you. Merci beaucoup ! Le 24 janvier 2019, par Tadesse Natea. Je l’a apprecie le discours qui a etait fait par Dr.Abiy Ahmad. J’aime beaucoup la collaboration entre le deux pays. Pou etre fort economiquement c’est tres important. vive la djbout et vive l’ethiopie. Érythrée … un appel du pied de Djibouti ? 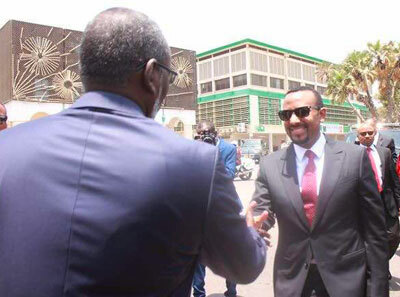 Abiy Ahmed Ali prix Nobel 2019… Why not ?